Thank you to all who donated to our collection for the Greece Ecumenical Food Shelf! We collected over 130 food/personal items plus $25.00 cash donations. Read our full article in the Greece News NY by clicking the link below. Happy 40th Birthday to the Honda Accord! The Honda Accord exemplifies the idea that if you make something great, people will flock to it. This is a car that has always offered something for everyone – quality, fuel economy, value, comfort. But why we really love the Accord is because, as former Car and Driver Editor in Chief Csaba Csere says in the video above, “it always drove a little bit better than the competition.” Today the Accord turns 40 years old. Over the past four decades Honda sold more than 12.7 million of them, making its iconic sedan the best-selling car in America during that time frame. 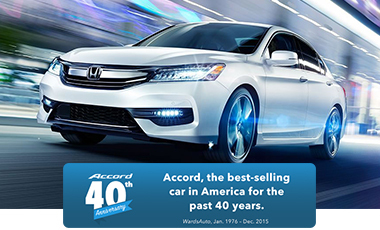 Honda likes to point out that the Accord is still young at heart, as it’s the most popular sedan with the under-35 crowd. To learn more about the great gas mileage and top features the Accord Hybrid has to offer, click HERE the Accord above. *49 city / 47 highway / 48 combined mpg rating. Based on 2017 EPA mileage ratings. Use for comparison purposes only. Your mileage will vary depending on driving conditions, how you drive and maintain your vehicle, battery-pack age/condition, and other factors. You may feel that changing the oil in your car is beyond your abilities, but there’s still one very important way you can keep up with motor oil maintenance. Checking your oil’s level from time to time and then topping off the reserve off will help you to keep your engine happy and healthy. When you do need to take care of that oil change, though, Ralph Honda would be happy to help. We offer competitive prices on oil changes, as well as other essential services like tire rotations, brake inspections, and timing belt replacements. If you would like set up an appointment with our service team, simply give us a call, make a service appointment online. Your oil is an important component of your engine because it acts as a lubricant between moving parts. Lubrication helps to cut down on friction, which in turn helps to cut down on heat. If the oil wasn’t doing its job, your engine would overheat, leading to expensive repairs or maybe even a new engine. That doesn’t mean very high heat levels still aren’t present, though, in a healthy engine. Little by little, your motor oil begins to burn off, shrinking the total amount of fluid in the system. If this oil isn’t replaced, then you run the risk of vital engine parts being exposed and open to heat damage and corrosion. Checking your oil can tell you where this level is at and if you should refill. 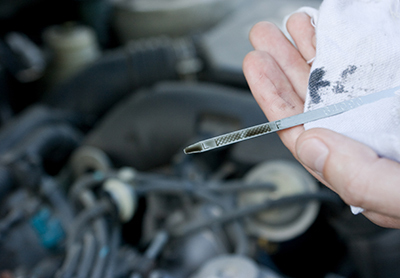 The first part to this process is locating the oil dipstick in your engine. It typically looks like a little yellow ring. Pull it out, wipe off the oil, and stick it back in. When you pull it out again, look at where the bead of oil falls on the stick in relation to the markings. If it looks good, don’t worry about it. If it’s looking a little low, then little by little, fill up on oil. In case you were wondering, don’t fill up through the dipstick. There should be a much larger hole on top of your engine block for the oil. The lid to this hole typically tells you what kind of motor oil to use. Using the wrong kind could cause serious damage, so make sure you get it right. Though filling up little by little and then checking it again may seem tedious, it’s key to not overflowing your reservoir. You’ll also get an idea in the future as to how much oil your engine needs. Call to schedule your appointment today at 585-299-2695 or schedule online: www.ralphhonda.com/service/schedule-service/! We have started the next phase of our remodel. When you come in for service, you will now enter through the 2nd garage door on the right where you will find our team ready to greet you!! We have a temporary waiting area or we will be happy to give you a shuttle ride home/work/shopping and pick you up when your vehicle is ready!! Once this part of the renovation is finished our new more spacious waiting area will be complete!! Thank you for your patience as we continue with our expansion to better serve you. 1. Using an electric mixer, beat the cream cheese and sugar until smooth. 2. Reduce the mixer speed to low and gradually add the heavy cream. Increase the speed to high and beat until thick and stiff, about 2 minutes. Beat in the lemon juice. 3. Spoon graham cracker crumbs into the jars. 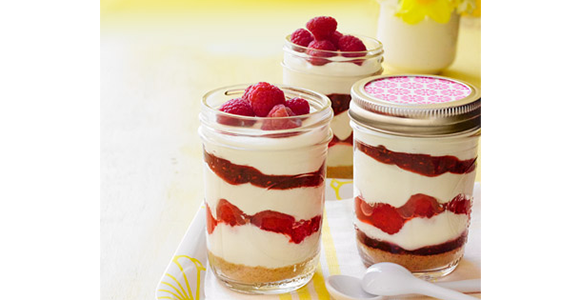 Top with cheesecake batter, raspberries, and jam, alternating red layers with cheesecake batter. Refrigerate for at least 2 hours before serving.